DAKAR (Reuters) - When Abasiama Idaresit started a digital marketing firm in Nigeria's bustling economic capital three years ago, he quickly learned how brutal life can be in a market where tech startups are in their infancy. No-one would lend him money to hire staff or pay for office space, so Idaresit spent eight months hustling the streets of Lagos, trying to convince clients his plan to help them develop online campaigns was a winner. "During those first eight months, I didn't make a dime ... I was demoralized. At some point I wondered if it was worth it," Idaresit told Reuters by telephone from his Lagos office. It took a money-back guarantee before a baby products retailer gave Idaresit a break with a $250 contract to develop the shop's online presence. Within two months, the retailer's revenue began growing by $1,000 per month. Then it hit $100,000. Idaresit's firm, Wild Fusions, is now a Google Adwords partner valued at $20 million, with revenues doubling year-on-year. It helps brands like Samsung, Unilever, and Ecobank develop online marketing strategies for African audiences. Wild Fusion's struggles are typical for startups in Africa, as the world's poorest continent wakes up slowly to the opportunities of technology. In other emerging markets like Asia and Latin America, a tech startup with a smart idea in a booming economy might expect to attract investor interest, especially if competition is slim. Business leaders and investors said the sector in Africa is held back by lower internet penetration as well as scarcity of early stage capital and a lack of management expertise. Many startups in the region are caught in a Catch 22 situation, said Churchill Mambe Nanje, who launched an online job search engine in Cameroon called Njorku. "To hire the best talent to develop a startup, you need capital. Finding capital is hard because you need to have a track record and a viable product but to get those, you need capital," said Nanje, whose company has been profiled by Forbes Magazine as one of Africa's best startups. Part of the problem for African tech startups is that internet use, despite mushrooming in the past decade, is low. Only 16 percent of Africa's 1 billion people use the Internet, half the rate in Asia Pacific and below a global average of 36 percent, the International Telecommunication Union (ITU) says. The information and community technology sector contributed just 7 percent to the continent's GDP last year, according to an African Development Bank report. Economic gains from rising internet usage are likely to be strong. For every 10-percentage point rise in broadband internet penetration, economic growth increases by 1.4 percentage points, according to the World Bank. 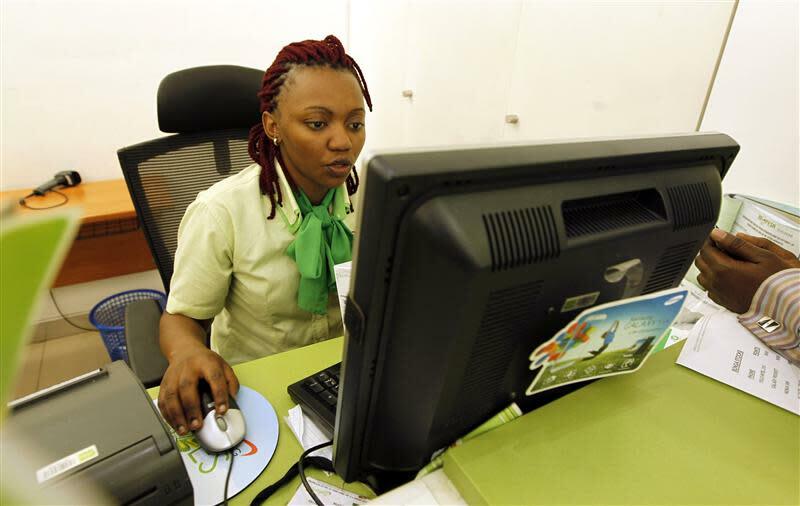 Experts say information and communication technology could help Africa overcome infrastructure inadequacies, satisfy rising consumer demand, boost regional trade and diversify economies, ending reliance on raw materials. But the problem is affordability. In its 2013 report, the ITU said that, though Africa has one the highest mobile broadband growth rates, services cost between a fifth and half of average income compared to just two to five percent in other developing countries. In South Africa, the strength of the tech sector reflects the country's relative affluence. It has produced several billion-dollar companies, some of which have been snapped up by international tech giants. In East Africa, Kenyan tech has also seen rapid growth. One highlight is mobile money transfer system M-Pesa, launched by the country's largest telecoms operator Safaricom. M-Pesa has enabled 67 percent of Kenyan adults to access banking. Its transactions total about $1 billion per month. Revenue from M-pesa rose 20 percent to 12.50 Billion Kenyan shillings ($145.99 million) in the first half of 2013. West Africa's tech sector lags in terms of prominence and investment, experts say. It needs better and cheaper internet access and broader adoption of smartphones. In Ghana, a booming regional economy, the number of mobile phone subscriptions roughly equals the population but only 3.5 percent of the population is online, according to Kwaku Sakyi-Addo, CEO of the Ghana Chamber of Telecommunications. The scarcity and costliness of finance also impedes success. Banks in Ghana can charge up to 28 percent interest for a business loan. Venture capital firms like Intel Capital, JPMorgan, Summit Partners and Rocket Internet have occasionally financed African ICT firms but business leaders said the sector needs much broader sources of finance. In Silicon Valley, startups can receive up to $2 million from a range of funders including venture capital firms, 'angel' investors and private equity houses, according to Marcin Hejka, a regional managing director for Intel Capital. Such a financial ecosystem does not yet exist in Africa, he says. Ghana's Rancard, which distributes Gmail SMS services on 55 mobile networks in Africa and beyond, received funding from Adlevo Capital and Intel Capital but its CEO recognizes it was one of the lucky few. "There are not enough early-stage tech venture capital funds available for Africa," Kofi Dadzie said. One reason for the lack of funding is the risks investors face, said Maurizio Caio, founder of UK venture capital firm TLcom Capital. Few tech entrepreneurs in Africa have a long track record to attract investors, said Caio. Crucially, there are hardly any examples of investors successfully exiting via an IPO or a sale, partly due to underdeveloped capital markets across the region. One exception is Fundamo, a mobile financial services provider in Cape Town bought by Visa in 2011 for $110 million. Kenya, Ghana and Nigeria have companies that could be ready for investment, Caio said: "It's earlier stage. It's smaller stuff, which means riskier, which means even less capital for these guys and even more of a gamble." Experts say it is too soon to tell if African tech will rival other emerging markets but a concerted effort is being made to build an infrastructure to facilitate expansion. Kenya's iHub started in 2010 with backing from Hivos, Google and Omidyar Network as a meeting place for entrepreneurs and investors. It has spawned around 50 companies. Another East African example is the Savannah Fund which offers $25,000-$500,000 to startups in exchange for equity. In Ghana, the Meltwater Entrepreneurial School of Technology gives students one year of training by professionals from around the world who volunteer to teach software development and entrepreneurship. The best graduates get an extra year at a tech incubator in a house linked to the main campus by a rope bridge. "The vision of the institution is to create jobs and wealth locally here in Africa," said its CEO Jorn Lyseggen. When the right idea with the right backing meets a hungry market, a start-up can grow fast, as the experience of Nigerian online retailers Jumia shows. Founded by two Nigerian Harvard Business School graduates, the business has benefited from Internet penetration in Nigeria of nearly 30 percent and a dearth of middle class retail outlets in the continent's most populous nation. Jumia is growing at 20 percent per month, orders have jumped from $50-$100 per day to millions of dollars per month and it plans to expand beyond Nigeria, said Sacha Poignonnec, Co-CEO of Africa Internet Holding, one of Jumia's backer. "The same way the mobile companies came in to leapfrog landlines, the same way mobile banking in East Africa is leapfrogging traditional banking, we see e-commerce as a way to leapfrog traditional brick and mortar retail here," said Tunde Kehinde, one of Jumia's founders.